Supreme Greens with MSM is a proprietary blend of green grasses and vegetables, spouted grains, herbs, and MSM (MethylSulfonylMethane). 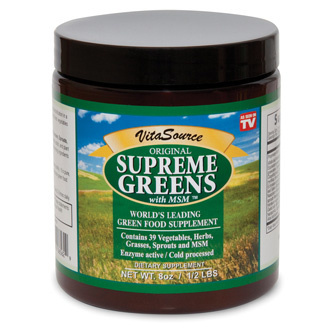 Supreme Greens with MSM contains alkaline forming ingredients to help balance your body's pH, while providing the body with the vitamins, minerals, antioxidants, amino acids, and plant proteins needed for cell support. Is this the easiest way to get your daily supply of vegetables in just seconds? A Teaspoon of This Can Give You 2lbs of Fresh Vegetables in Seconds It was Hippocrates, the father of modern medicine, who first said "Let your food be your medicine, and your medicine be your food." And to follow this great master's advice, nutritional science has conclusively demonstrated one of the most important foods for boosting your immunity and maintaining optimum health is leafy green vegetables. But let's face it. Even though we are told to eat more greens... even though the National Academy of Science and National Cancer Institute advises eating at least 5 to 9 servings of antioxidant-rich fruits and vegetables every day... how many of us actually do that? Now there's an easier solution. And it's quickly gaining a reputation as being "Nature's Fast Food" because it can provide your body with up to the equivalent of 2lbs of antioxidant-rich fresh vegetables into your daily diet with every single serving. Why? It's really quite simple. Although eating empty foods may ward off your feelings of hunger, it doesn't mean you are getting the vitamins, minerals and proteins required for good health. In fact, according to the U.S. Senate Document No. 264... "The alarming fact is that foods (fruits, vegetables and grains) now being raised on millions of acres of land that no longer contains enough of certain minerals, are starving us - no matter how much we eat. No man of today can eat enough fruits and vegetables to supply his system with the minerals he requires for perfect health because his stomach isn't big enough to hold them. "The truth is that our foods vary enormously in value, and some of them aren't worth eating as food... Our physical well-being is more directly dependent upon the minerals we take into our system than upon calories or vitamins or upon the precise proportions of starch, protein or carbohydrates we consume." Keep in mind that was quoted in1936, and things have only become worse since then. For instance, a study by a Rutgers University professor found some tomatoes had 2,000 times more iron in them than others. And it all boiled down to the soil in which the tomato was grown. But here's a disturbing fact: In 1964, when the US Department of Agriculture decided to follow up on the Rutgers study, they examined the element "iron" to see how much of it was in various vegetables grown in different places. And guess what? The average amount of iron in vegetables had dropped by 80% in between 1948 and 1963. Imagine what those levels are at today? The reality is the nutrition in our fruit and vegetables has declined to such a level that it now takes 60 servings of spinach to get the same amount of iron as just one serving in 1948. And that is why you need Supreme Greens with MSM. It is simply the fastest, easiest way to help your body overcome this deficiency, and provide you with cellular nutrition, renewal and detoxification in a powerful, safe and all-natural way. So get ready to experience sustained energy all day long, because the Supreme Greens formula gives you the nutrition you need to help avoid the normal up and down energy yo-yo most people experience, so you can find a constant energy from morning until night. But I think you'll find it to be a very pleasant one. Supreme Greens with MSM can help you lose weight easily and naturally, just by bringing your body back into its natural balance and supplying you with the nutrients you need. You'll also find it can control your hunger and cravings. As a result of this, some people find their excess weight naturally melts away. So what exactly is Supreme Greens with MSM? It is a proprietary blend of green grasses and vegetables, sprouted grains, herbs and MSM (MethylSulfonylMethane). And it contains alkaline forming ingredients to help balance your body's pH while providing your body with vitamins, minerals, antioxidants, amino acids, and plant proteins needed for cell support. Alfalfa Leaf: The Arabic word Alfalfa means "father of plants." And the reason why alfalfa is such a powerful food all boils down to the fact it has its roots down twenty to thirty feet into the ground and can therefore draw up minerals which are not available on the surface. It contains protein and is rich in Vitamin C, D, K, B6, B1 and A. As well as an abundance of minerals including calcium, zinc, carotene, iron and potassium. Parsley Leaf: One of the most under-appreciated foods on the planet, this vegetable provides you with three times as much vitamin C as oranges, an exceptional iron content to help you absorb the vitamin c, and an ample supply of vitamin K necessary for your bones to get the minerals they need to form properly. And considering the fact it also contains manganese, inositol, calcium, phosphorous, potassium and sulphur. You can see why it is such a powerful addition to your daily diet. Chlorophyll: he molecular structure of chlorophyll resembles that of haemoglobin, the oxygen-carrying protein of red blood cells which stimulates healthy tissue-cell growth and helps normalise blood pressure. The key difference between the two is the metallic atom in the middle of our red blood cells is iron, while the metallic atom at the centre of a molecule of chlorophyll is magnesium. Interestingly enough, in experiments conducted on anemic animals, blood counts returned to normal following four to five days of receiving chlorophyll. There are 39 magical ingredients just like this in the formula. And the best part is, despite the fact there are no additional additives, our scientists have invested hundreds of hours of testing using herbs such as mint and peppermint leaf, to ensure the Supreme Green Formula is not only good for you, but tastes great too.